For the past ten weeks, I had the good fortune of working with AHI as a summer fellow researching post-disaster, post-conflict settlements around the globe –or as we at AHI like to call it, instant cities. For the purposes of our research, we define instant cities as spaces that result from mass, rapid migration from disruptive circumstances. These spaces have a sizable population with food, shelter, water, and other living needs but limited or no supportive physical infrastructure. In turn, this situation creates many humanitarian, economic, operational, and environmental challenges. As an urban planning student with a background in architecture, this subject piques my interest because the confluence of these challenges unfolds at an accelerated rate. And I mean very accelerated. Think: building-and-providing-for-200,000-people-or the-equivalent-of-a-third-of-Boston-in-two-weeks-accelerated (which was the actual case for Zaatari, the Syrian refugee camp in Jordan). I presume many relief practitioners are drawn to this field of work because of, among many other reasons, the tabula rasa condition of new camps, I certainly was. But in reality, there is no blank slate. Resource-scare site conditions, clashing neighboring host communities, and unclear land titles are all already present at the start of the camp. Yet, many of the camps reviewed this summer do not publicly document these issues unless they become problematic. Are there ways that host countries could be more proactive instead of reactive in this field? Are there possible economic synergies that could take place to make the camp residents and host communities feel more productive? Should states bordering contentious territories prepare refugee contingency plans in advance? This research raised a lot of questions and we started to identify gaps in our knowledge of instant cities. Thus far, our findings are still preliminary, but it is clear that this subject is understudied. 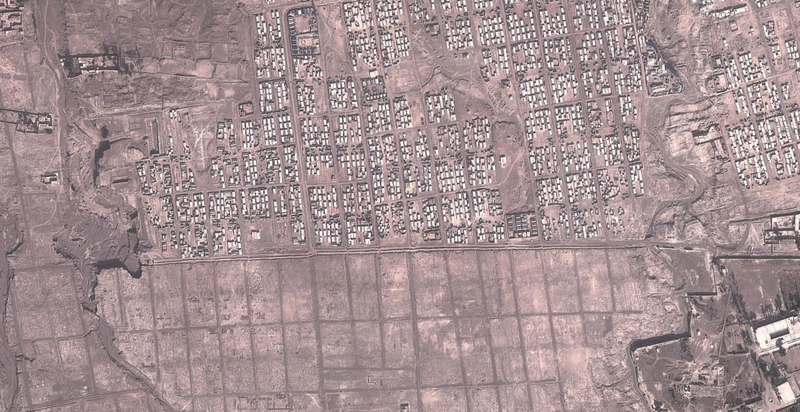 Aerial of Jalozai Refugee Camp in Pakistan. What happens when the camp “closes” and all the aid agencies leave? 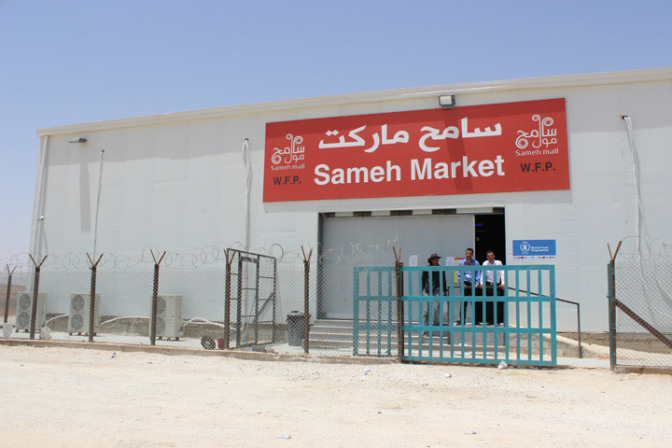 Azraq, a Syrian refugee camp in Jordan, is among the first refugee camps to provide a supermarket for its residents instead of cooked meals. Aid agencies hope that this would foster a sense of normalcy and dignity. This entry was posted in AHI Activities, Current events, Discussion, News and tagged AHI, Camps, Cities, Instant City, resettlement camp, urban planning, Zaatari refugee camp on August 5, 2014 by ahiglobal. AHI was privileged to work in the recent past with Slum Dwellers International (SDI) and organizations in the Sinai area of Nairobi, Kenya, to help residents structure a plan to buy land so that they could gain security of tenure and the ability to improve their homes. Our sympathies go out to the people affected by the fire tragedy. The Sinai slum sits on either side of a Kenya Pipeline Company (KPC) pipeline that feeds a fuel depot off Lunga Lunga road in Nairobi’s Industrial Area, about one kilometer from the company’s headquarters in Pipeline Estate in Embakasi, and three miles from Kenya’s main international airport. The settlement sprang up to serve this industrial quarter. Witnesses say that fuel from a leak in the pipe poured into the sewer ditches that cut through the slum, attracting crowds of slum residents hoping to decant oil into containers. Many of these men, women and children were among the nearly 100 people who died after the fuel burst into flames some hours later. The explosion, whose origins are unclear, occured during the morning rush hour and spread rapidly through the settlement’s tin shacks to cover a wide area. Vice President Kalonzo Musyoka appealed to Kenyans to be calm, saying investigations into the fire have been launched, and urged Kenyans to support the affected families. Hundreds are being treated for injuries and the final death toll could be much higher. At least 112 people were admitted to hospitals with severe burns. Kenyatta National Hospital has sent out appeals for blood donations to save their lives. Prime Minister Raila Odinga has said that the Government would cover medical expenses for the injured and compensation to victims’ families. He stated that the accident was the worst tragedy to occur in the history of the country in the energy sector. The Kenyan government has declared two days of national mourning. According to state-owned KPC, the fuel leak was caused when a gasket burst due to pressure buildup in the pipe. The Standard reports that the affected 33-year old Mombasa-Nairobi pipeline had been declared obsolete and in need of replacement as early as 1999. Slum residents say that leaks are commonplace. In 2006, the company had singled out the 300,000 residents of Sinai-Lunga Lunga and Mukuru in Embakasi slums as being at particular risk due to pipeline vandalism and expanding shanties, saying that they were “sitting on a time bomb and in case of an oil spill, the effects will be unimaginable in the crowded slums.” However, the very poor have no option but to squat wherever they can, usually on precarious land. In 2008, KPC issued the slum dwellers with an eviction notice in order to expand the pipeline. The residents maintained that insufficient time had been given to relocate their community, so that the forced eviction would destroy the local economy and leave them destitute. They requested compensation and a relocation plan, but are still awaiting both. The Business Daily notes that a resettlement action plan funded by the World Bank is currently being prepared. There has been ongoing criticism of the City Council for its failure to follow through on its policy of relocating people out of slums on unsafe land, and of the National Government for the non-implementation of the National Policy for Disaster Management in Kenya. In 2009, about 120 people were killed in Western Kenya when people rushed to collect fuel from a crashed tanker that then exploded. This entry was posted in Current events, Geographic focus, News and tagged Africa, slums on September 13, 2011 by ahiglobal. What’s happening in Affordable Housing? Next week, the 3rd Asia Pacific Housing Forum and Exhibition 2011 will take place in Bangkok, Thailand. On the heels of current environmental calamities, this convening of practitioners engaged in providing urban poverty housing solutions will concentrate on “Sustainable Shelter in an Age of Climate Change and Disasters,” sharing experiences around the problems of substandard housing, and looking to integrate disaster mitigative strategies into ‘bottom-up’ development planning processes. KBC News – Prime Minister Raila Odinga has announced government plans to resume the construction of more housing units under the stalled slum upgrading project in Kibera. Major roads rehabilitation projects were factored in the current financial year also. The Hindu – Data released recently by the Indian government shows a distinct lack of progress in providing housing for the poor. Only by exploring innovative practices from other regions, and radically changing the approach to the provision of social housing, can the vision of making cities slum-free be realised. Market Watch – The AFL-CIO Housing Investment Trust (HIT) is putting construction workers back on the job: The HIT created more than 10,000 union construction jobs during the past two years, and set a new goal of reaching 15,000 jobs by year-end 2012. It is already on its way to meeting this new objective with more than 11,000 jobs created to date. Realwire – Equfund, the social investments and finance specialist, has opened an investment opportunity to use private investment to tackle the growing housing crisis, and is appealing to investors to fund community self-build projects in some of the UK’s most deprived areas. Through the scheme, those who cannot afford to buy a home can invest their own time and effort in building or renovating a property in return for a deposit and financial support. Israel’s affordable housing crisis can be fixed by adapting New York City’s combination of public financing incentives to attract private capital, land disposition strategies to promote economically diverse communities, and a wide range of private and nonprofit developers to construct and manage properties. An essential ingredient is government leadership in creating these tools.. This entry was posted in Current events, Housing Events, News and tagged News on September 2, 2011 by ahiglobal. We round up this week’s affordable housing related news, insights, and events from news sources, RSS feeds, and collegues. IEWY News – Egyptian authorities and political parties must put the rights of the country’s 12 million slum-dwellers at the top of their agenda if they are to meet the demands for social justice and human dignity championed during the “25 January Revolution”, Amnesty International said today in a new report. Guardian UK – What the rolling back of support programmes for vulnerable people reveals is how important the housing sector is to the delivery of these essential services. As housing gathers its message for government, allowing tenants to tell their story may prove the wisest lobbying tool. Business Standard – Global alternative asset manager The Carlyle Group today announced it will invest US$26 million into Value & Budget Housing Corporation (VBHC), a pioneer in the construction and development of affordable entry level housing in India. Reuters – The Obama administration is looking at options for reviving the housing market, an Achilles heel for the struggling U.S. economic recovery. It continues to “look for ways to ease the burden on struggling homeowners and to help stabilize the market.” The article looks at some policies the administration could turn to help the housing sector. PR Newswire – The Urban Land Conservancy (ULC) purchased its fifth property for $1.35 million using Denver’s Transit-Oriented Development (TOD) Fund on Tuesday, a unique fund specifically set up with ULC, Enterprise Community Partners, City and County of Denver and other investors, to acquire and preserve land for workforce housing near light rail stops and high frequency bus routes. Build UK – Housing Minister Grant Shapps has announced Government plans to give councils more financial freedoms to improve, buy and build new housing for their local community. New proposals, published today for consultation, will allow councils more flexibility to trade their assets, and use the receipts to enable further investment in new homes and regenerating the local area. CNN-IBN Live – With the Kerala State Housing Board yet to come out of the deep financial crisis, the State Government has mooted the creation of Kerala State Housing Development Finance Corporation with the objective of mobilising funds for the housing sector in the state. A feasibility study will be carried out to understand the existing housing finance scenario in the state, based on the financial requirement of individuals belonging to various economic categories and that of real estate developers. SLT Today – The Missouri Housing Development Commission has is considering a proposal by state Treasurer Clint Zweifel to dedicate one-third of next year’s tax credit allocations — $122 million — to projects that benefit people who are vulnerable to homelessness. The concept partners developers and existing agencies to construct projects that house and service needy populations. IPS – Sweden’s current development agenda for sustainable cities in developing countries includes strong political support for democracy and measures to promote the participation of poor people and marginalised groups in the management of basic services, including water resources and sanitation. This entry was posted in Current events, News and tagged conservation, homelessness, News, sustainability on August 26, 2011 by ahiglobal. Secession: the key to more affordable housing in cities?